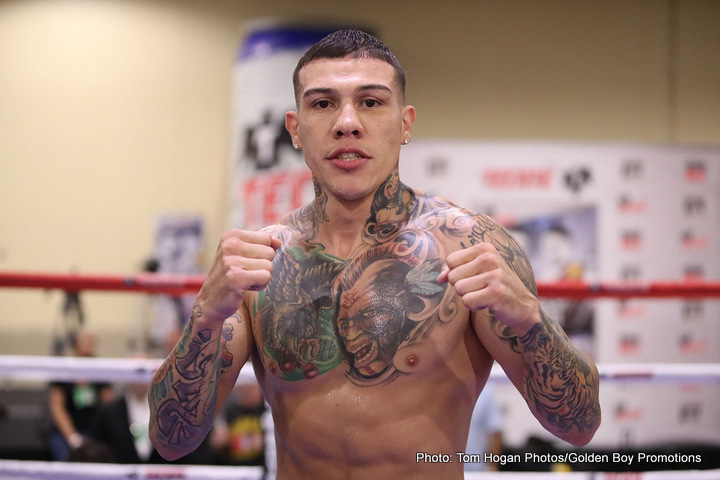 Gabriel “King” Rosado (23-11, 13 KOs) and Glen “Jersey Boy” Tapia (23-4, 15 KOs) are set to collide in a battle between two experienced middleweights in the 10-round main event of the October 19 edition of Golden Boy Boxing on ESPN at Park Theater at Monte Carlo Resort and Casino in Las Vegas. The ESPN 3 livestream of the undercard bouts begins at approximately 6:30 p.m. PT/9:30 p.m. ET. The ESPN2 and ESPN Deportes transmission will begin at 8:00 p.m. PT/11:00 p.m. ET. Rosado is a native of Philadelphia, Pennsylvania known for his willingness to fight anyone and anywhere. The 31-year-old has taken on a who’s who of middleweight champions and contenders, including unified middleweight champion Gennady “GGG” Golovkin, former IBF middleweight titlist David Lemieux and former WBO 160-pound champion Peter “Kid Chocolate” Quillin. Rosado will look to get another chance at the middleweight rankings against a dangerous opponent with power in both hands. Tapia, of Passaic, New Jersey, has also faced top competitors in two divisions, including tough fights against James “Mandingo Warrior” Kirkland, David Lemieux and Jason “El Animal” Quigley. Both men are eager for another defining win in their careers, which promises for an exciting battle with years of hard work on the line. In the co-main event scheduled for 10 rounds, Alejandro “El Elegido” Barrera (27-3, 17 KOs), of Nuevo Leon, Mexico, will take on KeAndre “The Truth” Gibson (17-1-1, 7 KOs) in a welterweight fight. Barrera was last seen beating Eddie “E-Boy” Gomez via upset split decision on the July 29 edition of Golden Boy Boxing on ESPN and will look to do the same against Gibson, a native of St. Louis, Missouri whose only lost was against the top super lightweight contender Antonio “Relentless” Orozco. Las Vegas featherweight prospect Francisco Esparza (6-0, 2 KOs) will battle against a soon-to-be announced opponent in a six-round featherweight swing bout. Opponents for Israel Duffus (15-4, 12 KOs), a Los Angeles native who will compete in a six-round super middleweight bout, and Bekman Soylybayev (11-0, 4 KOs), who will defend his WBC International Super Featherweight title in a ten-round fight, will be announced shortly. Opening the night’s festivities will be Randy Moreno (9-1, 8 KOs) of Las Vegas who will face Jesus Aguinaga (5-5-2) of Phoenix, Ariz. in six-round super featherweight fight. Rosado vs. Tapia is a 10-round middleweight fight presented by Golden Boy Promotions. The event is sponsored by Tecate, BORN BOLD and Hennessy, Never Stop, Never Settle. The event will be held at Park Theater at Monte Carlo in Las Vegas. The ESPN 3 livestream of the undercard bouts begins at approximately 6:30 p.m. PT/9:30 p.m. ET. The ESPN2 and ESPN Deportes transmission will begin at 8:00 p.m. PT/11:00 p.m. ET. Tickets priced at $25, $45, $65 and $85, not including taxes or fees, for Rosado vs. Tapia will go on sale, Friday Sept. 22 at 10:00 a.m. PT. To charge by phone with a major credit card, call the Ticketmaster Contact Center at (800) 745-3000. Tickets will also be available for purchase online at www.ticketmaster.com, www.ParkTheaterLV.com, or visiting any MGM Resorts Ticket Office.